These are embarrassing thoughts. These are the kind of thoughts you’d find rummaging in my head. And they’re embarrassing because all these are such minor things compared to Jim Tucker’s yoga story. Jim had a regular practice for years. Until life happened. In November 2010 he woke up after intestinal surgery and the doctors told him his limbs weren’t getting any blood. They wanted to amputate all four. His arms and legs were purple and numb. Yoga seemed a thing of the past for him, nothing more than a nice memory of down dogs and arm balances. 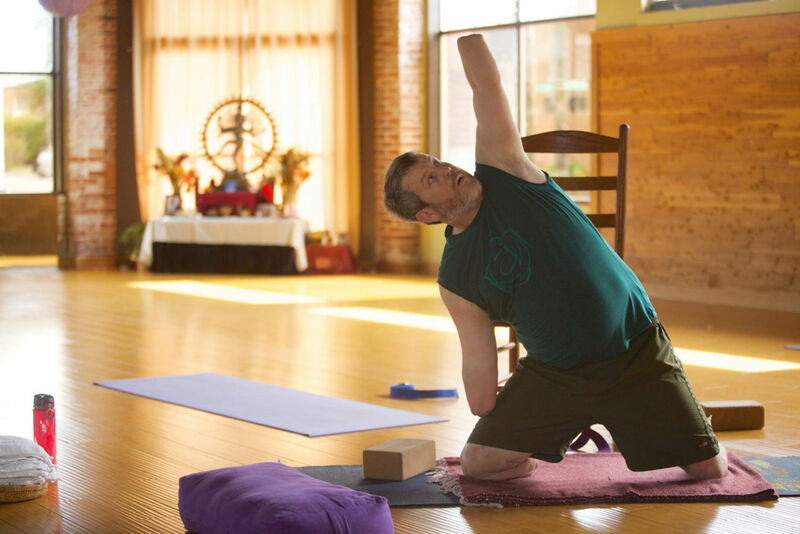 Until Jim found another approach to yoga: He started practising with Kate Dessommes who offers free “Yoga for Amputees” classes. Shortly after, Jim was back at the yoga studio – regularly. At the beginning of each class Jim would strip off his arms and legs and then work through a range of chest stretches and spine lengthening movements, the locust posture and – because all the nerve endings still exist – he can for example activate the muscles that would stretch his fingers. So next time I feel I can’t do my practice because of an aching joint or a painful wrist, I’ll think of Jim – and find ways to modify postures. They always say “Yoga is working with the mind, through the body.” I feel Jim might just be one of the most advanced practitioners out there. Read on here (image credit) and check out Kate’s classes here. Thank you for this post. I needed it right now, as I’m trying to find ways to resume my practice with a badly broken wrist (open fracture, two puncture wounds, metal plate for internal fixation that prevents flexion or extension). Thanks for the reminder that I can find ways to work around my current limitation! Thanks for being an Inspiration, Jim, and Andrea, thanks for Sharing. Reblogged this on my WordPress blog, Against All Odds. So inspiring. Thanks for sharing. Read this first thing this morning and it will certainly set the tone for my day in a positive way. Think of Jim next time you are thinking of “reasons” to not hit the mat/gym. Thanks Andrea for sharing Jim’s story! What a wonderful and inspiring person! I will think of him next time I start making those excuses myself.